The Potato Reset – Weight Loss & Recipe Guide has over 30 slimming potato recipes and 15 sauce recipes designed to help you RESET your tastebuds and lose weight without getting HANGRY! 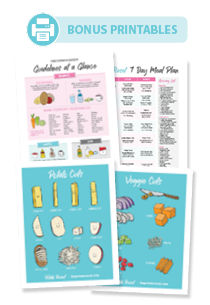 BONUS PRINTABLES: 7 Day Meal Plan, G​​​​uidelines at a Glance, Potato Cuts and Veggie Cuts are included as single page PDFs for you to print out for quick and easy reference! WHY GO DIGITAL? I prefer digital eBooks myself because I like having my recipes available at all times, it's especially handy while grocery shopping. It can be put on your smartphone, tablet and computer. I've also made it easy for you to print off the entire book or individual pages as needed. The Potato Reset is a great guide for anyone looking to lose weight, regain their health or press the reset button on their palate. I know from experience how amazing a potato diet can be for you. Being able to eat until your full everyday and having energy to tackle life all while losing weight is the definition of a great diet to me. This book will give you all the tools to get back on track and some amazing recipes so that you never feel deprived. The Potato Reset is beautiful in its simplicity, beautiful in its design and beautiful in its message. The information and inspiration in this book will give you everything you need to get started down a new, healthful path in both body and mind. After discovering how filling potatoes were and how they were the key to my weight loss success I couldn't help but share that discovery with as many people as possible. I even called my site Potato Strong so that people would stop demonizing this filling and nutritious food. Jeanine's book is beautifully designed, chock full of no oil potato-based recipes and great advice that will reset your taste buds and get you lean and healthy. In an effort to simplify and prove once and for all that a carbohydrate-rich diet does not cause weight gain, in February 2017, Jeannine ate only potatoes for an entire month and as a result, lost 8 pounds, diminished junk food cravings and reset her taste buds. Since then she has lost 30 pounds eating a potato-based diet and inspired many others to do the same. She is passionate about helping those with autoimmune conditions, particularly Hashimoto's Thyroiditis, that the potato is not to be feared! "If I can lose weight, at 42, with hypothyroidism ANYONE CAN!" Pictured here on the left is Jeannine last February, at 201 pounds and on the right in November at 169 pounds. 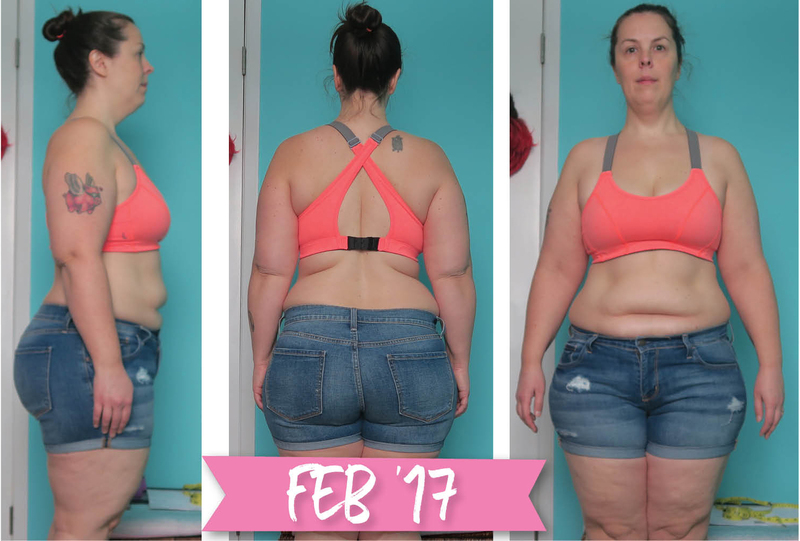 She lost most of the weight between February and August. Hi everyone! My name is Jeannine, affectionately known as Potato Wisdom on YouTube (formerly Banana Wisdom). 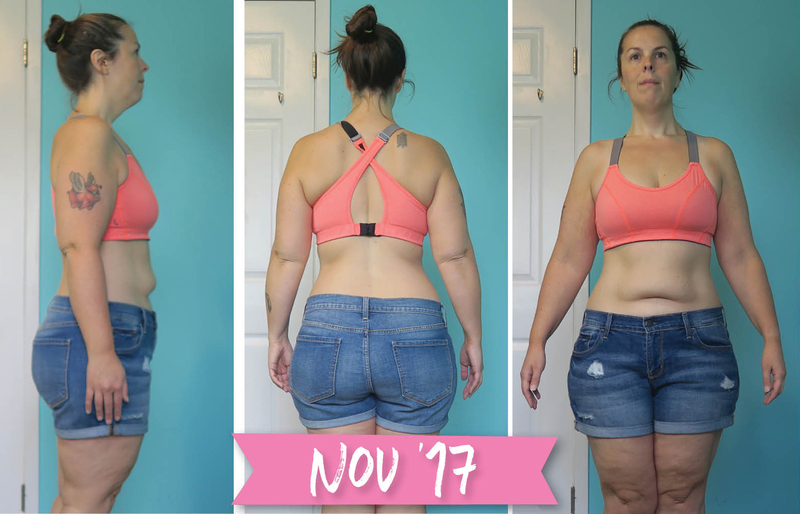 In the past eight months I’ve completely changed my relationship with food and lost over 33 pounds – without driving myself crazy or feeling deprived. Age the age of 32 I was diagnosed with Hashimoto's Thyroiditis and possible thyroid cancer. I weighed 260 pounds, it hurt to walk, I slept 15 hours a day and suffered from severe depression. Now, at the age of 42, I feel more energetic, vibrant and happy than I did 10 years ago. 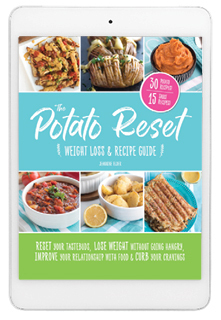 THE PRINTED VERSION of The Potato Reset Weight Loss & Recipe Guide is available in paperback on Amazon.com and Amazon in other countries (please check your local Amazon).